Gulf view coastal retreat for sale in Seagrove Beach, FL. Just off the 30A bike path, this Seagrove home features 5 bedrooms, 4 bathrooms, a private pool, gulf views, 2 master suites, tankless water heater, travertine floors, covered porches, and 3,840 sq. ft. of heated and cooled space. Conveniently located just one half mile to Seaside, this home is rental ready. 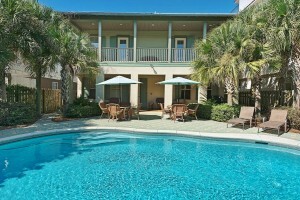 Contact us today to view this Seagrove beach home for sale.